Ipoh City Council organised a “buka puasa” treat for 50 children from Ar‑Raudhah Baitul Mubarouqah Orphanage, Gunung Rapat. The event was held at Kinta Riverfront Hotel and Resort, Ipoh and was hosted by the Mayor, Dato’ Roshidi Hashim. The orphans received “duit raya” from the Mayor. Tourism Perak came up with a novel idea to dispense bubur lambuk for all and sundry. The breakfast delicacy, a hit with most Muslims, was mass produced on the grounds of Stadium Indera Mulia, Ipoh on the evening of Thursday, August 9. The porridge was then packed into plastic containers and given to visitors and passers-by. Over 6,000 packs were prepared. 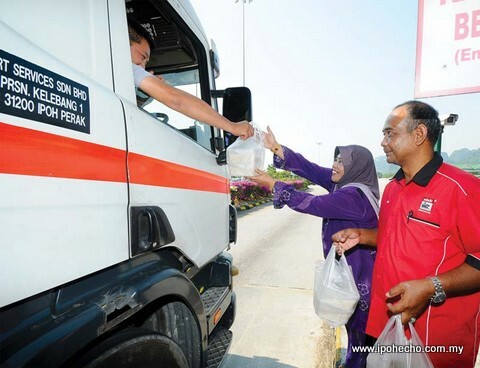 Dato’ Hamidah Osman and her staff then distributed the packs to passing motorists at the Ipoh PLUS toll gates.